Yamaha gifts cut section engine models to ITI Colleges | IAMABIKER - Everything Motorcycle! 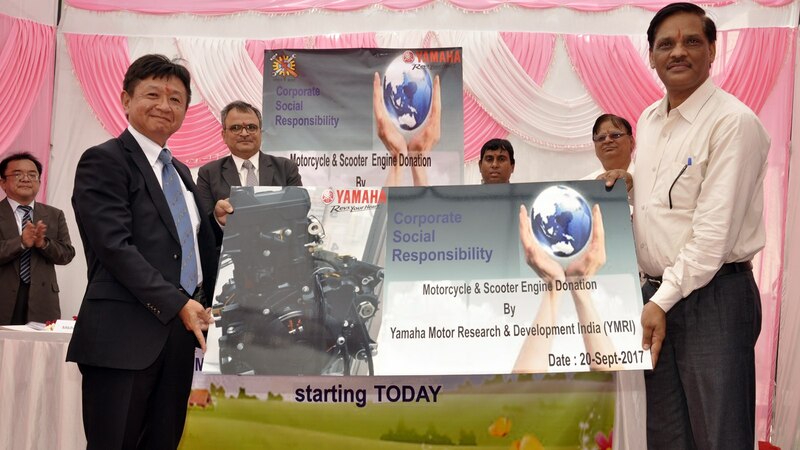 As a part of the Corporate Social Responsibility and in an effort to empower youth through skill development, Yamaha Motor Research & Development India (YMRI) on Wednesday donated six cut section engine models to three Industrial Training Institutes located in Uttar Pradesh. The purpose of donating these models is to support the infrastructure of the government institutions and also provide students with an opportunity to get better training facilities. The donation ceremony was organised at the Government Industrial Training Institute located in Sector 31, Noida. ITI colleges from Muradnagar in Ghaziabad & Hapur were also part of the ceremony. Mr. Yasuo Ishihara, Managing Director, YMRI donated 6 cut section engine models including one FZ bike Engine & one Ray Z Scooter Engine to Mr. Vipin Kumar, Principal, Government Industrial Training Institute, Muradnagar, Mr. Mukesh Pratap Singh, Principal, Government Industrial Training Institute, Hapur and Mr. Sunil Kumar, Principal, Government Industrial Training Institute, Noida. All the three colleges received 2 cut section engine models each. He further emphasised that Yamaha is totally commitment towards the continuous development of the local talents and contribution towards the Skill India Mission launched by the Indian Government. The senior management of YMRI also interacted with the students at the ITI College and shared their experience in the automobile industry. The college authorities stated that contribution by corporates will help them in creating a better infrastructure and providing a better environment for the students to learn and train. IYM has been engaged in several CSR activities across India with an objective to contribute towards the development of the society as a whole. Recently, IYM inaugurated a technical training institute – Yamaha NTTF Training Centre (YNCT) at its Chennai Factory to impart training to youth from the rural areas of Tamil Nadu on the Japanese manufacturing methods. Similarly, IYM has been running Yamaha Training Schools (YTS) across India with an aim to provide technical training to the economically weaker youth, school dropouts enabling them to become an expert 2-wheeler technicians and thereafter, they could be employed gainfully at Yamaha Dealerships and become productive member of the society.